We would love to hear from you! Please give us a call or stop by. 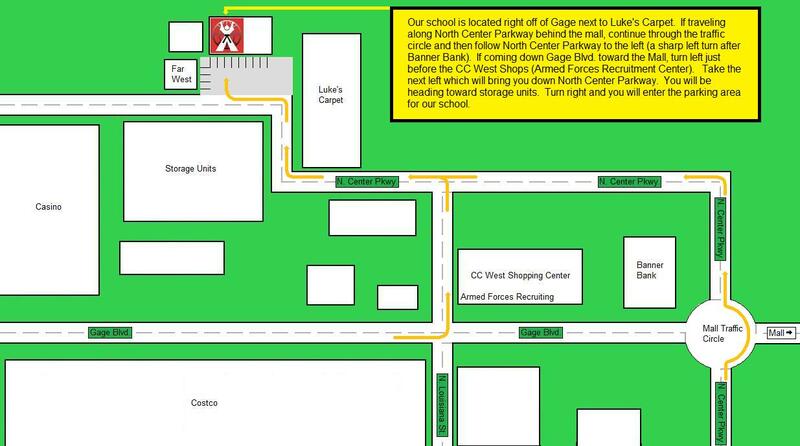 Our school is located right off of Gage next to Luke's Carpet. If traveling along North Center Parkway behind the mall, continue through the traffic circle and then follow North Center Parkway to the left (a sharp left turn after Banner Bank). If coming down Gage Blvd. toward the Mall, turn left just before the CC West Shops (Armed Forces Recruitment Center). Take the next left which will bring you down North Center Parkway. You will be heading toward storage units. Turn right and you will enter the parking area for our school. For ease of location please see the map below. Please click here for a satellite map to the school. While it is best to make an appointment, if you would like to stop in, the best time is approximately 7 PM to 7:30 PM on Monday and Wednesday, as Shihan Weyer will most likely be available to speak with you at that time.